10th Period: Ohio Supreme Court: ECOT can't get money for kids it doesn't educate. Really. Ohio Supreme Court: ECOT can't get money for kids it doesn't educate. Really. Well, like all courts before it, the Ohio Supreme Court came to the pretty common sense conclusion that the Electronic Classroom of Tomorrow should have to prove it's actually educating kids before taxpayers pay them to educate kids. Really. It took an Ohio Supreme Court ruling to establish the pretty common sense idea that eschools should have to prove they are educating kids before taxpayers pay them in Ohio. Here is the core of the Court's ruling that was handed down this morning. I remind my friends outside of Ohio that the fact the state's highest court had to write this sentence indicates just how far we need to come on eschool policy. "We determine that R.C. 3314.08 is unambiguous and authorizes ODE to require an e-school to provide data of the duration of a student’s participation to substantiate that school’s funding." What's more amazing is this: Two of the court's 7 Justices ... disagreed! Two Ohio Supreme Court Justices said it's fine for taxpayers to pay ECOT to educate kids it can't prove it educated. But we are living in Ohio. 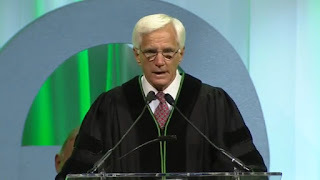 Oh, and does it surprise anyone that one of those two was Justice Terrence O'Donnell who spoke at ECOT's 2013 graduation -- in his Justice's robes no less -- and bragged about how ECOT founder and massive campaign contributor Bill Lager had a direct line to his office? But there are very interesting tidbits in the dissent. For example, it explains over and over again that when the Ohio General Assembly established the state's charter school system, it never intended for the Ohio Department of Education to figure out whether kids going to these schools were actually being educated in them. I swear. That's what the dissent said. "It is telling that the legislature addressed many of the concerns motivating this litigation—i.e., that e-schools should have to maintain records documenting student participation—without expressly linking state education funding to the duration of online participation." The dissenters are correct here: It is telling that the Ohio GA wouldn't tie any of this to funding at e-schools. In fact, it's pretty clear that the reason ECOT was ever held to account wasn't because of the Ohio General Assembly, or the Ohio Auditor of State, or the Ohio Attorney General. It was because the Ohio Department of Education asked ECOT a very simple question: Prove you're educating these kids. When they couldn't, ODE asked for taxpayer money back. Did ODE have statutory authority to do that? The Ohio Supreme Court ruled today that it did. But don't misconstrue this. The reason the court let ODE do this was because of common sense. As Chief Justice Maureen O'Connor said during oral arguments when ECOT claimed that the school should be paid even if kids enrolled there do no work: "How is that not absurd?" But the dissent makes a good point, and lays bare one of the core issues with Ohio's highly political eschool policy: The politicians who have taken money from ECOT founder Bill Lager and OHDELA founder David Brennan for more than 20 years created a system where those two guys could be paid billions of dollars and never have to educate a single kid. Absurd as it may be, that is exactly the system Ohio's politicians set up for their contributors. And it is a system that finally may be changing as its absurdity is revealed and those enablers begin to be held to account. Just view it and see interesting facts about ECOT. In which we read all the facts about ECOT scandals.